The salivary glands are part of the digestive system. 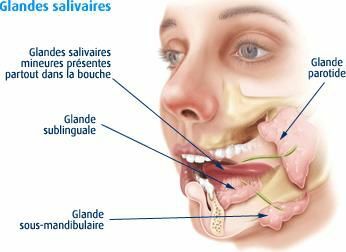 The salivary glands produce a fluid called saliva which bathes the mouth, keeping the mucosal membranes moist and also performing the first stage of digestion and facilitating the passage of food into the stomach. The salivary glands are exocrine glands that excrete saliva. Saliva composed of water (99%), inorganic substances (ions), organic substances (glucose, urea, hormones), and digestive enzymes (amylase, lipase, lysozyme, etc.). In addition to its role in digestion, saliva also has an antiseptic action that specifically protects the teeth from caries. More than a litre of saliva is secreted daily, only half of which is during meals. Salivation is a reflex triggered by the presence of food in the mouth or by smells or emotions. The salivation reflex is innate but can be acquired, as was shown in the famous Pavlov's dogsexperiments). The sub-maxillary glands are located beneath the angle of the mandible and pour saliva through the Wharton duct beneath the front of the tongue. The secretory cells are mixed (mucosal but above all serous). The sub-lingual glands are located beneath the tongue and secrete saliva through many ducts. It has mixed secretory cells (serous and particularly mucus). The salivary glands are contained in vascularised innervated connective tissue capsules. The secretory cells (mucosal or serous) are assembled in clusters (acini) but secrete saliva into their cavity. The acini are surrounded by small muscles which facilitate the expression of your saliva.